Welcome back! I was off on Monday traipsing around the many fine licensed establishments of Bromley (the one in South London), and then I completely forgot about this update. Here it is, in time for the weekend. 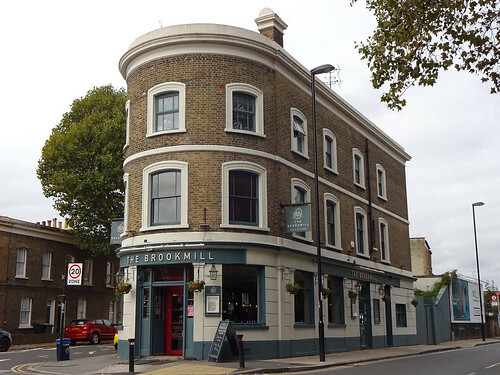 Your featured article this week is The Brookmill, SE8 4EJ. It's a long, narrow pub in an awkward corner site, with jazz on the sound system and five handpulls for ale. There is even a very interesting sounding vegan burger on the menu. Sounds like a nice place. * The Windsor Castle in Kensington/Notting Hill, a well-divided and partitioned bar with lots of area and character, and frankly it's a surprise it hasn't been on RGL until now. Can't really go wrong, it's a classic pub, just watch out for posh locals I guess? There's also a new entry for the distinctly not-a-pub Trullo, an Italian restaurant by Highbury Corner. It's very popular, and that makes sense given the quality of the food. Definitely one for pasta exploration. There are also updates to The Temperance pub in Fulham (cavernous! ), Dalchini in Wimbledon (Indo-Chinese food! though be careful), and The Lion in Teddington/Hampton Wick (partly a French restaurant now!). Finally, reported permanent closure for Kenya Coffee House in Romford, which may yet find a new location. 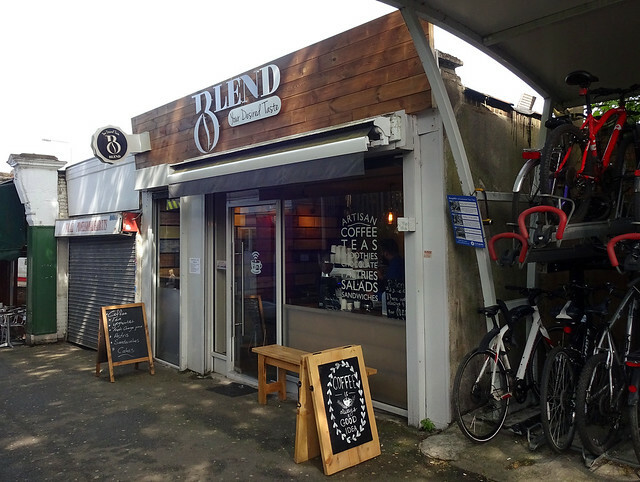 This week's featured article is Blend, a microcafe in Norbury. It's hard for me to think about hot drinks right now, but if I'm ever around that way, I'll be sure to check out their excellent selection of loose leaf teas. They also serve a curated selection of breakfast faves and sangers, and you'll likely be able to charge your phone or other electronic device if need be. Two new articles have been added - Obia in Croydon's restaurant quarter serves an interesting falafel burger, though it appears the curse of the structurally unsound veg burger knows no bounds. If that seems a bit outré, you can always stick with their traditional Italian classics. Still in Croydon, Kalpa serves Sri Lankan and Keralan food. Our reviewers were satisfied by the overall quality, though slightly underwhelmed by the mutonniness off the mutton rolls. Updates have been made to Viet Grill in Shoreditch. Perhaps try the Saigon Feed set lunch, where you can choose from a limited selection of starters and mains, one of which is called "grilled piggy aubergine" and which our reviewer found quite nice. So this week, our featured player is Tokyo Diner, WC2H 7JP, a busy if sparsely-decorated Japanese veteran, which won't take your tips and does a fine agedashi tofu. New to the team is Blend, another compact Norbury tea and coffee lover with a fine view of railway platforms, offering what we're calling sensibly-balanced food. We have a breakfast-related update to Affogato, also found in Norbury. Finally, looks like Hiep Phat in Walworth might be going, but we're not sure yet. Tins and boxes of Chinese and Vietnamese groceries may no longer be available at this location in SE17, but we're just waiting confirmation on its fate. 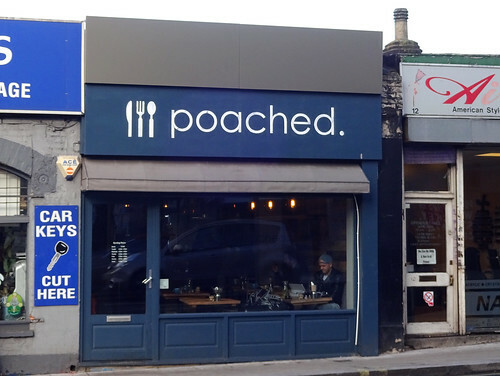 This week's featured article is Poached,a friendly little cafe in Beckenham which doesn't quite hit the RLG gold standard of "very good" as yet, but shows great promise. 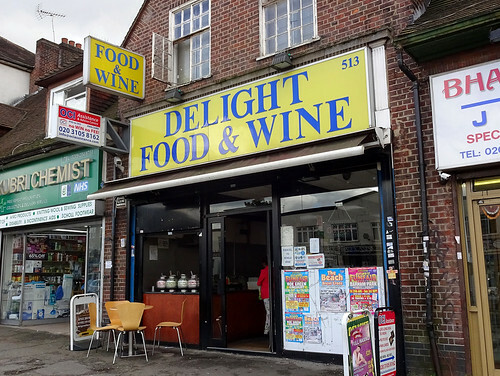 Two new articles have been added - Blue Jay Cafe, a child-friendly Caribbean cafe in South Norwood, and Dilara/Uyghur Restaurant, a Turkish and Uyghu restaurant in Finsbury Park that may appear to be a standard kebab shop but seats quite a few and offers a larger variety than your typical doner. Updates have been made to Tram Stop cafe in Addiscombe, the Crown and Greyhound pub in Dulwich Village, and Flavaz N Spices, a Guyanese takeaway and bakery in Anerley. Three reported permanent pub closures this week, Antigallican in Charlton, White House, a Wetherspooon's pub located between Hayes and East Drayton, and the curiously named Load of Hay in Uxbridge. Finally, a less permanent closure, the Canbury Arms, a gastropub in Kingston, is closed for refurbishment and due to reopen later this year. 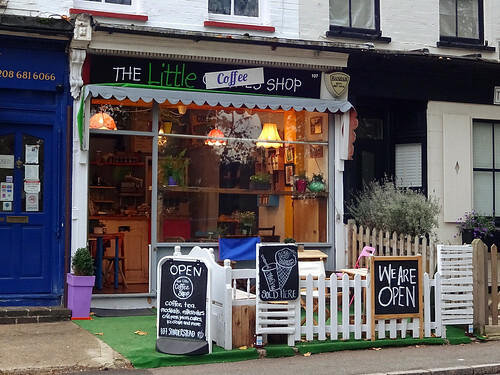 The featured article is Little Coffee Shop, CR2 0PJ, and I know what you're thinking: it's probably a coffee shop, and perhaps it's quite small in size. Well, on the second point, you wouldn't be wrong: we reckon it holds about 10 people, with a few more out front on a patio. On the first point, well it does serve coffee, but it also does tea (watch out for overbrewing dangers)! Plus you can get food there too, like sandwiches for example, or muffins. They have some good savoury muffins in particular. Still, might not be worth a special visit, but it's special for those who are local. Hello and welcome to another week of RGL. The featured article this week is Flavours of Paani Puri, NW9 9EG, a vegetarian Indian cafe in Kingsbury. It looks from the outside like a convenience store but don't be fooled! It's great value too. There are three new articles this week. We have for you Tea Cosy, a cafe in Upminster, like an upmarket greasy spoon I suppose, is that what "British cafe" means? There's also Ashley Brook Fabrics, a rare article about something not food- or drink-related, this one being a Romford fabric shop. Finally, there's Little Coffee Shop in South Croydon. I have a small quiz for you: guess what it is. Those who answered "it's a little coffee shop" win! We have an update to the Crumpled Horn article, a pub out Upminster way. Finally a bunch of reported closures for you: Muncho cafe in Croydon; The Case Is Altered pub in Harrow Weald; The King's Arms pub in East Molesey; The White Horse pub in Hampstead Heath (this one is always opening and closing); The Railway Wetherspoons pub in Putney; The Goldsmiths' Arms in East Acton; and The Duke of York in Chiswick. Hello and welcome back and sorry for the delay this week; things got busy at work at then... Oh well. 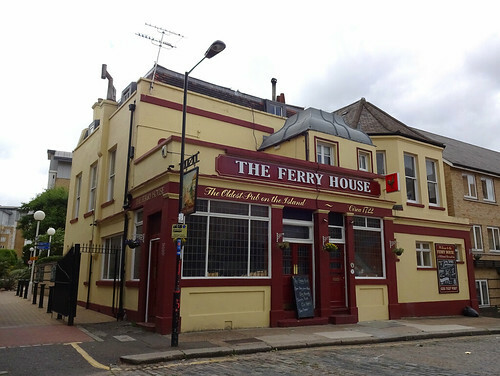 So the featured article this week is The Ferry House, E14 3DT, a pub on the Isle of Dogs, still very traditional though with fewer dartboards and less sticky carpet than that might usually entail. It's got Courage beer and Sunday roast, though. One new article is Pivaz, in London-adjacent and Central Line-terminating Epping. It's a somewhat upmarket Turkish restaurant, with tasty breakfast options and attentive staff. Our reported permanent closures are The Cricketers, a small pub in Croydon (just near the Lebanon Road tram stop), and Dirty Burger in Kentish Town, though it was never much more than an outhouse shack and I was a meat-eater the last time I went there, giving a sense of its long and storied existence (i.e. it's several years old). Finally, we can report the reopening of Affogato, a Norbury coffee shop and cafe, so there's no reason now to cancel all your Norbury travel plans this summer. 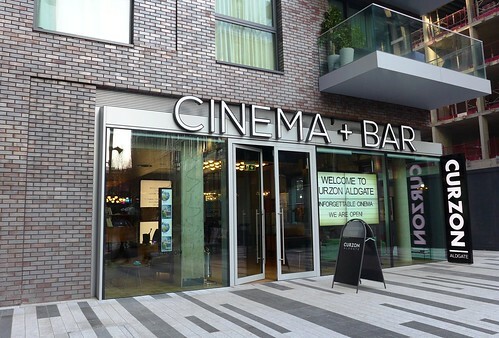 This week's (slightly belated) update sees the Curzon Aldgate cinema, opened this year, as our featured article. Currently at the Curzon Aldgate, humans are at war with the Transformers, and Optimus Prime has vanished. It's up to the unlikely alliance of Mark Wahlberg, Anthony Hopkins and Laura Haddock to save the day via a series of expensive-looking explosions. There's a new article for Long Shot Coffee in Whitechapel, serving coffee, tea, soup and sandwiches. Tito's Peruvian restaurant in London Bridge has had an update after a visit (featuring an insufficient quantity of prawns), as has Le Raj in Epsom (which does a decent veg biryani). The latter also has air-conditioning, so I'm sorely tempted to go there this very instant. 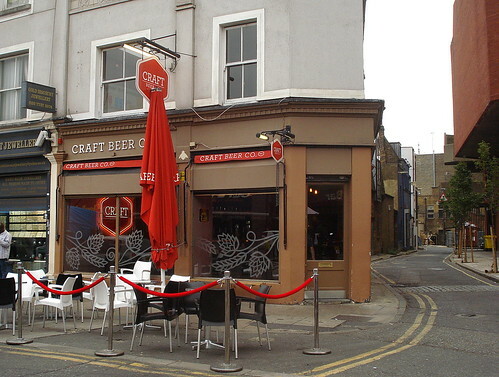 This week's featured article is for the Brixton branch of the Craft Beer Co, where you'll find the usual vast selection of keg and cask beer. There's seating space on the first floor but be careful when carrying your drinks up the 'fool of a' staircase: your correspondent's other half suffered an Exciting Injury in this manner a couple of years ago. Readers may also wish to note that the excellent Kings College Hospital A&E is but a short bus ride away! Our RGL crew has been hard at work of late investigating the delights of Tooting - this week we bring you Saravanaa Bhavan, a veggie-only Indian restaurant whose menu includes the intriguingly named 'Business Meal'. There's also a new page for Affogatto, a modern coffee shop in Norbury. Some closures to report too: the miniscule Oriental Chinese Shop in Surrey Quays, and Chinese Family in Greenwich. Finally, I'm sad to hear of the closure of HK Diner by Leicester Square - the first place I ever tried bubble tea. Happy New Year to all our RGL readers! 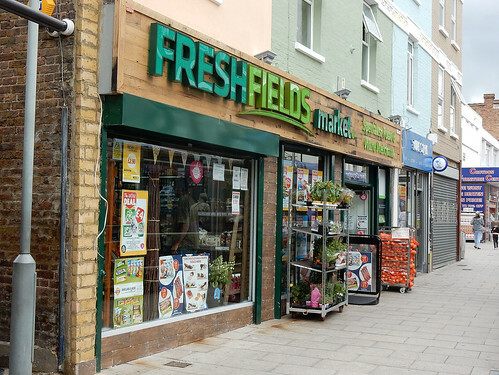 Our first featured article of 2016 is Fresh Fields Market in Croydon, a supermarket that stocks interesting craft beers, including some on cask. A whole bunch of new stuff has arrived over the Xmas break: also hailing from Croydon is An Nam, a Vietnamese restaurant in the Wing Yip centre, and just across the Purley Way is Tigris, serving Middle Eastern food. A fast train to Victoria will plonk you outside the St George's Tavern, a large, busy Nicholson's pub which you can book out for events. Moving East to Limehouse, the Husk is a coffee shop and community space run by the London City Mission, just down the road from the Old Ship (a trad pub that still has some carpet left) and Shanshuijian, a Chinese restaurant specialising in a tasty-sounding lamb hotpot. Holland Park tube station has decided to sit out most of 2016 and get its lifts replaced instead. After hauling myself off the sofa and back into the office today, I have to say don't blame it. 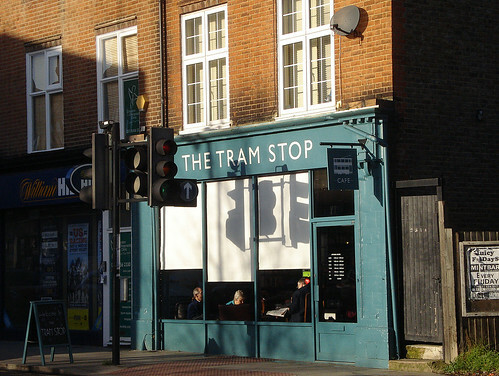 Our featured article is Tram Stop, CR0 6RD, which is not in fact a tram stop but is right next to one (Addiscombe tram stop that is). It's a small coffee shop and cafe. 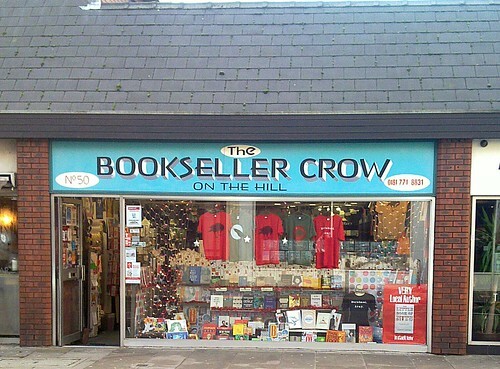 It's child-friendly, and offers newspapers and bookswap books. The food is seasonal and good too! Two new articles are: Magma, a small Ghanaian restaurant in Thornton Heath with a fine palaver sauce; and Gojo, doing Ethiopian food in a North Kensington basement, better than it sounds. Four reported closures we've caught up with are: the Marylebone High St branch of Nicolas wine shop; the Barnes branch of Spirited Wines; Just Falafel in Covent Garden; and Japanese restaurant Kibou in sunny Wimbledon. * the East Dulwich branch. Welcome back to the regular RGL update! 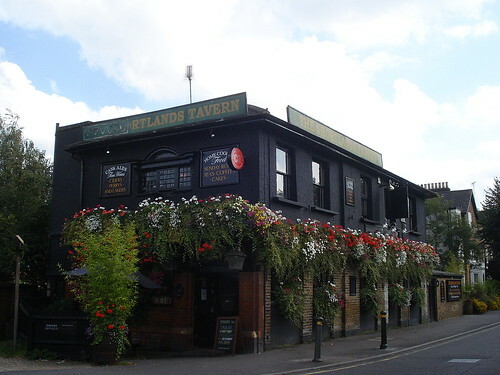 This week's featured article is The Shortlands Tavern, BR2 0EY. In the (possibly quite likely) case that you don't know where Shortlands is, well it's just to the west of Bromley. As for the pub, it's a nice space with a handful of handpulls (though a lot more it could be using...). One new entry is Fee & Brown, a cafe and coffee shop in sunny Beckenham, who'll make you a top pot of tea. Finally we have an update for Vijay, a South Indian restaurant in Kilburn. If you visit, you may find yourself rather lonely at lunchtime. Afternoon all, a quick update this week. Our featured article is for Ladudu, a modern Vietnamese coffee shop in West Hampstead. Perfect if you fancy a bit of pho before jumping on the Thameslink, or indeed some chicken livers before embarking on the Jubilee line. We've also got a new article for Mazi, a Turkish restaurant in Croydon serving quality ocakbasi kebabs and stews. They serve fresh Turkish bread rather than your standard dry pittas and the lamb is lovely and tender. I can almost smell the charcoal from here! This week's featured article is for the Williams Ale And Cider House. It's a cosy Good Beer Guide pub, hidden away in a Spitalfields alleyway, not far from Liverpool Street station. 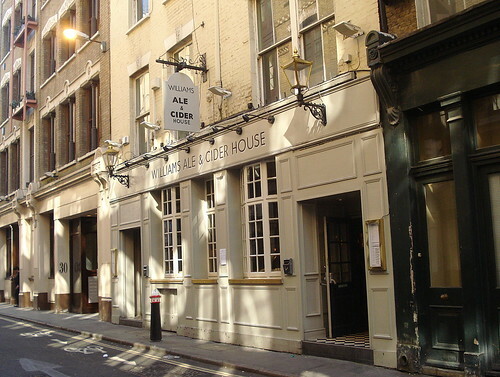 As you can tell from the name, it is keen to promote its large range of beers and ciders, and overall seems like good alternative to the more obvious pubs on Bishopsgate itself. 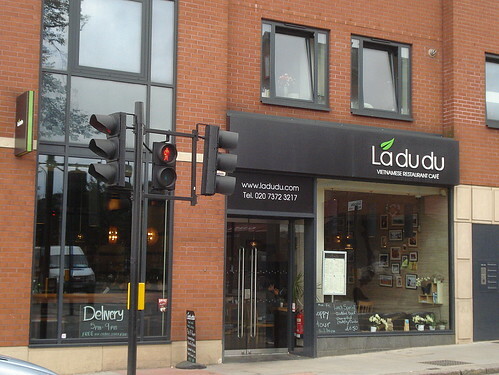 New to RGL is Ladudu, a Vietnamese restaurant and coffee shop in West Hampstead. It's named after the Vietnamese for 'papaya leaf', and as well as coffee, the menu features a choice of three different Vietnamese beers to go with your spring rolls. Finally, Dost in Uxbridge has closed. The good citizens of UB8 now have an ice cream shop in its place. Hello all! This week we travel a world of food. 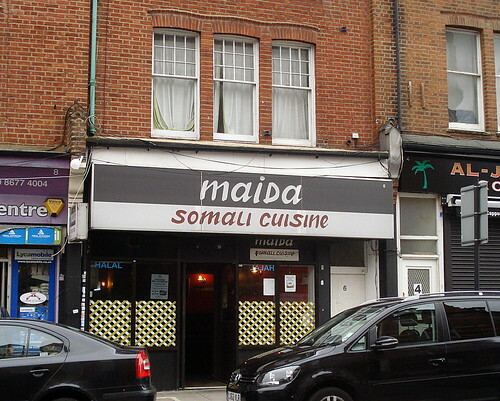 There's a new featured article again this week, which is Maida, SW16 6AB. It's a good value Somali cafe/restaurant where you can load up on as much tender lamb as you want. New articles are: Ergon, a Greek restaurant/deli in Marylebone; Bunga Raya, a good Malaysian restaurant and takeaway in Thornton Heath; VQ, a 24hr cafe in Bloomsbury; Castle kebab shop in Walworth; and the Guy's Hospital branch of dependable coffee stall AMT Coffee. Permanently reported closures are, sadly, the very excellent locals' pub The North Pole on the Isle of Dogs, and Moyo-Ma, a Nigerian restaurant in Walworth. Welcome back, and for this week's update your featured article is the wonderfully named Bongo East, IG11 8RW. 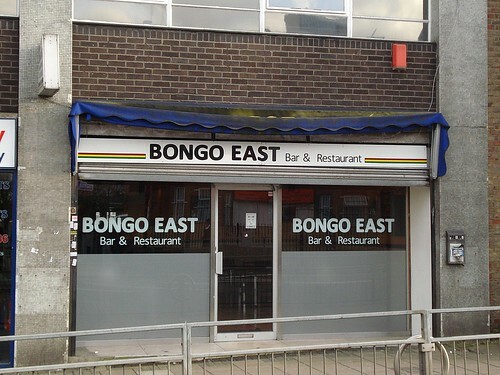 It's an unflashy Ghanaian bar and restaurant in Barking, with a nice line in spicy fufu and a tempting kelewele. Seems like it might need a few more customers, so why not pop in next time you visit Barking? My colleague Kat has added an article about Back on Track Coffee in Marylebone which is a coffee shop with a model train twist and a punning name to match. 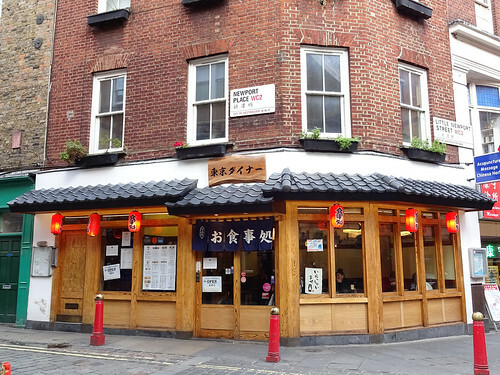 We also have a Chinese restaurant in Bloomsbury, China City, but you might be better off avoiding it for dimsum. I've also added a bunch of pubs: The Hack and Hop, near Blackfriars; The Draft House on Goodge Street (or "Draft House Charlotte" as the website calls it); and Mother Kelly's "tap room and bottle shop" in Bethnal Green. All three do great beers, in slightly different ways. There's an update to Hampstead Heath Station (it's accessible! ), and a temporary closure at The Half Moon in Herne Hill. Closed more permanently is The Prince of Wales in Battersea, which I certainly have memories of. Finally, a possible closure is Manus Palm Grove in Stratford, pending further information, but it hasn't been open for a while it seems. 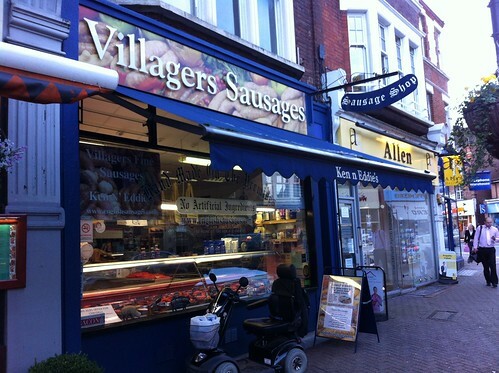 This week's featured article is for Villagers Sausages in Beckenham. This butchers specialises in sausages, as you might have guessed from the name. There are plenty of varieties on offer for sausage-lovers - including duck! I don't think I've ever seen a duck sausage before, except for a brief glimpse on one of those specialist Freeview channels. They'll also sharpen your knives for a reasonable rate, if you're worried your cutlery might not be up to handling your mighty sausage. There's a new article for Blue Turtle Oasis, a coffee shop in Loughborough Junction that's bigger on the inside. Reports that Peter Capaldi has been fiddling with the espresso machine inside have been completely made up by me just now. Finally, the excellent Viajante restaurant in Bethnal Green is closing at the end of this month, as head chef Nuno Mendes is opening up a new place in Marylebone (which apparently will be very different menu-wise and atmosphere-wise). 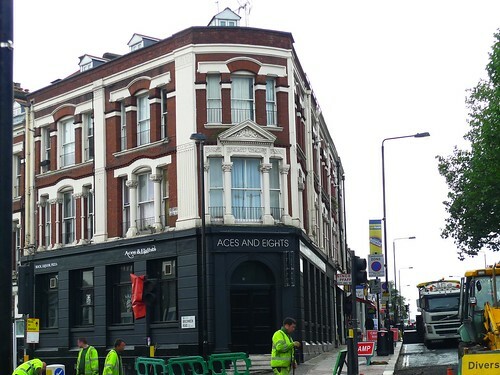 This week's featured article is Aces and Eights, NW5 2HP, a drinking establishment in Tufnell Park (where Bar Lorca used to be) which will serve you a bunch of bourbons, a cavalcade of cocktails and a procession of pizzas. It's a friendly place with an American rock-n-roll diner theme so expect QUIFFS (personally I am very partial to quiffs). Brand spanking new articles: Wenlock and Essex, a bar near the bottom of Essex road with a decent beer selection; La Bodeguita Deli, a Colombian cafe at the top of Elephant & Castle Shopping Centre; Caffe Venezia, a patriotically-decorated Italian cafe over in Hounslow; Bromley Cafe, a greasy spoon in -- wait for it -- Bromley; and the branches of AMT Coffee and Marks & Spencer in St Thomas' Hospital. Red marker pen at the ready! You can permanently cross off the Gramaphone bar in Spitalfields (shortly becoming a Mexican restaurant) and the Clarendon pub in Newington Green (once the 'Nobody Inn', now called 'The Dissenting Assembly'). Further renaming confusion: tiny German sandwich shop Zeitgeist Lunch Box is now called Zeitgeist Coffee Bar. As long as they still do sauerkraut that's fine by us. Have YOU been to a newly-opened pub or restaurant recently? Were there pictures of Italy on the walls? Was there sauerkraut? Let us know in the comments and we'll go and check it out! Sorry for no update last week, as I was on holiday. Last week's featured article was The Parcel Yard, N1C 4AH, Fuller's excellent new flagship pub in King's Cross station. 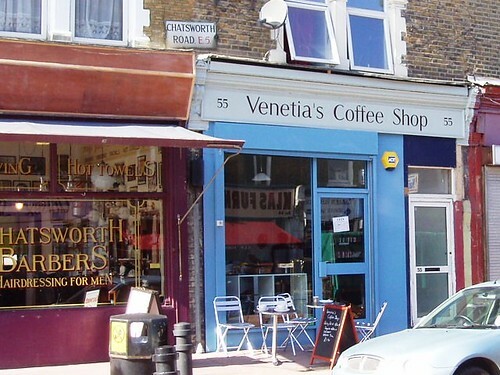 This week's featured article is Venetia's Coffee Shop, E5 0LH, a coffee shop on Chatsworth Road in Lower Clapton. Additions are: The Havelock Tavern, a gastropub in West Kensington; and Hardy's Brasserie in Marylebone. Reported closures are: The New Chandos, a pub in Colindale; So Asia, an Asian buffet in Acton; and Muna's, an Eritrean/Sudanese restaurant in Harringay.